Ann Kinsey Schu focuses her practice in the areas of family law, estate planning, and civil litigation. Ms. Schu received her juris doctor from the University of San Diego School of Law where she served as the fifty-first Editor-in-Chief of the San Diego Law Review and authored A Modern King Solomon’s Dilemma: Why State Legislatures Should Give Courts the Discretion to Find that a Child Has More than Two Legal Parents, 51 San Diego L. Rev. 295 (2014). 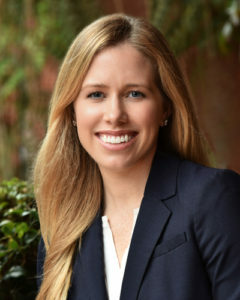 During law school, Ms. Schu externed for the Honorable M. James Lorenz of the U.S. District Court for the Southern District of California and the Honorable Amy M. Pellman of the Los Angeles Superior Court. Prior to law school, Ms. Schu worked for three years for the Children’s Aid Society in the Bronx, New York as a foster care caseworker and the educational coordinator. Ms. Schu received her Bachelor of Arts from the University of Pennsylvania, majoring in Psychology and minoring in Sociology. As a member of the Penn softball team, Ms. Schu was awarded First Team All-Ivy honors for four years, was unanimously voted the 2007 Ivy League Player of the Year, and served as a captain her junior and senior seasons.